As you can probably guess I love Lilly Pulitzer. The bright fun prints are my favorite but they aren't quite suitable for winter. I would wear my Lilly shift dress everyday if I could but when it's 40 degrees outside a shift dress isn't weather appropriate. 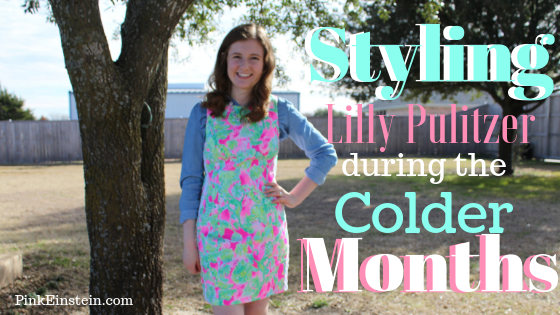 I came up with two ways to wear your Lilly during winter without freezing or looking out of place in your bright clothes. I paired my Mila Shift dress with a chambray button up underneath and added brown riding boots. It's been pretty warm in Texas recently but if you live somewhere colder a pair of tights or leggings could also be worn. I purchased the Colette scalloped skirt during the summer APS and love it! I paired it with a pink tee and a fuzzy gray cardigan over top which helps to tone down the colors a little bit. For shoes I'm wearing a pair of gray lace up flats but gray booties would also look cute. 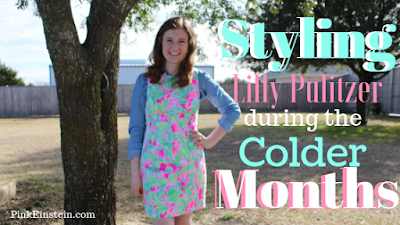 If you would like more ideas on how to wear Lilly dresses when it's cold, last winter I shared three ways I style printed dress and you can read that post by clicking here.